A new bill could help more Californians afford to shop at farmers’ markets and food hubs and help pave the way for similar efforts nationwide. For many low-income folks living in food swamps, the problem isn’t so much a lack of food, as an overabundance of highly-processed, unhealthy foods. 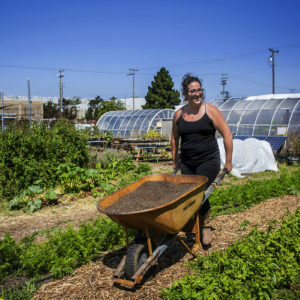 For some California residents, however, the scales might have just been tipped toward access to fresh, locally grown fruits and vegetables. In October, the state’s legislature passed the California Nutrition Incentives Act (AB 1321), a bill that could create a nutrition matching incentive program within the state’s Office of Farm to Fork. The idea—pioneered on a national level and implemented in 33 states by the nonprofit organization Wholesome Wave—is a simple one. These programs encourage low-income shoppers to buy local produce at farmers’ markets by matching their “food stamps,” or federal supplemental nutrition (or SNAP), benefits dollar for dollar. California already has a relatively large-scale matching program called Market Match, run by the Berkeley-based Ecology Center, and has seen matching incentives increase the redemption of nutrition benefits at farmers’ markets from 132 percent to 700 percent since 2009. So why is the state getting involved? It all started last year when when U.S. Agriculture Secretary Tom Vilsack announced an unprecedented $100 million in competitive Food Insecurity Nutrition Incentive (FINI) grants, authorized by the 2014 Farm Bill, to be made available over the course of five years to fund healthy food incentive programs across the U.S. 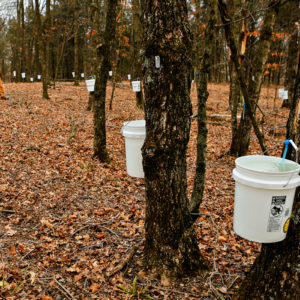 In April 2015, the U.S. Department of Agriculture announced the first round of awardees. Washington state received the largest funding, with a nearly $6 million FINI grant. Massachusetts, another state that had organized a coordinated effort to apply for the grant money, received nearly $4 million. Immediately, California food policy advocates asked why these two smaller states received more money than California, a state with a vast network of farmers’ markets, over 700 at last count, and 4 million people with inadequate access to safe, nutritious, affordable food. “Government likes to give to government,” said Michael Dimock, president of the nonprofit Roots of Change, which co-sponsored and lobbied for AB 1321. The bill was the response to the missed opportunity, and Dimock and others hope it will improve California’s chances to receive bigger grants from the USDA. A few existing organizations in California did actually receive some funding from the USDA grants after applying on their own. Market Match received $3.7 million over two years to expand their programs across the state. Mandela Marketplace, a food equity focused nonprofit based in Oakland, received $422,000. 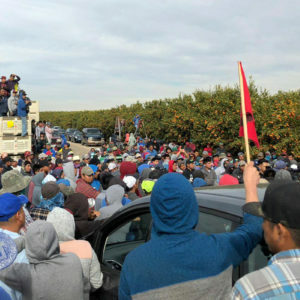 But the state’s food policy advocates thought the number, especially when California’s size, population, and existing farmers’ market network was taken into account, should have been larger. Hence, AB 1321. With legislation approved, the next step is to obtain actual funding for the program, which needs to match any USDA dollars it receives, says Sarah Hanson of the Office of Farm to Fork. And with a fiscally conservative governor at the helm, that won’t be easy. The state’s legislature approved a budget request for $5 million for this purpose during the last budget cycle, but then the governor cut it at the last minute, according to Dimock. In addition to allowing the state to apply for federal funds, the new bill is only one of a handful of efforts in recent years to codify healthy food for SNAP recipients into state law. In 2013, South Carolina’s governor Nikki Haley’s administration petitioned the USDA for a waiver that would allow only healthy foods to be purchased with food stamps. Another Republican lawmaker proposed similar legislation in Wisconsin. 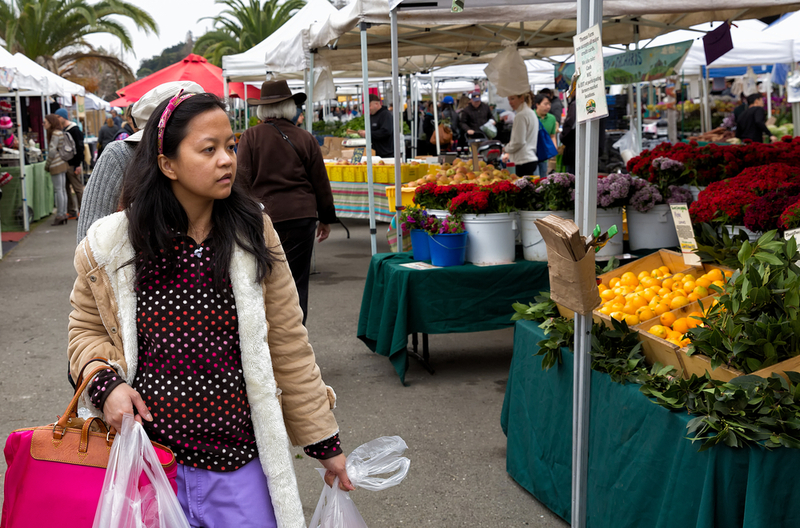 Unlike the previous examples, the new California legislation provides a placeholder for funds to expand healthy food incentives at farmers’ markets and local markets but does not limit what CalFresh users choose to buy at supermarkets. Julia Pon directs the National Nutrition Incentive Network at Wholesome Wave. She says the new legislation shows that healthy food programs are gaining traction on a state-by-state basis, and establishes California as a leader. “Even if AB 1321 just creates a placeholder for future funding … hopefully, Wholesome Wave can take this legislation and its language as an example to share with other states where we work, to help those groups have success implementing similar things,” says Pon. Rebecca DeLaRosa, director of legislative affairs at the Latino Coalition for a Healthy California, another co-sponsor of AB 1321, also points to the symbolism inherent in the bill’s passage. It “symbolically recognizes that there is a model that works, one that emphasizes partnerships between local governments, farms, organizations, and foundations,” she says. Still, unless the state legislature approves the funding next year, the legislation functions more as a pledge of good will than anything else. For that reason, AB 1321 isn’t a comprehensive solution to the problem of equitable healthy food access in California, but it is a starting point.